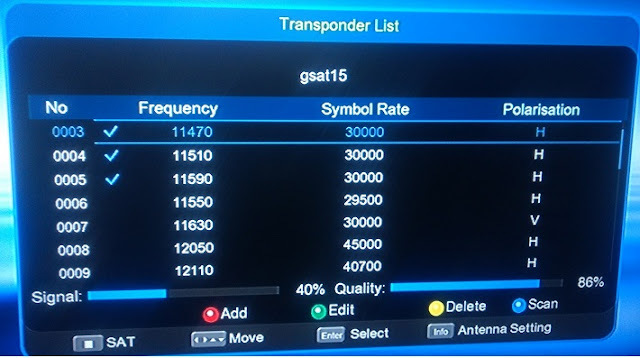 Good news for DD Free Dish (DD Direct Plus) users, 3 new Horizontal frequencies has been added on GSAT-15 at 93.5° east. When you will tune MPEG-4 or HD Set-top box then you will get these transponders. You will not get any TV or Radio channels but you will get signals. Please keep visit us on www.freedish.in for all latest updates of DD Free dish or DD Direct DTH. All TPs are same why it says three / 3 TP added in DD Direct Satalite??? channel ka standard bahat hi low hai . kuch english movie channel or discovery jayse chennel vi add kijiye please . Plz add some Bangoli Chanel. Please add some Bangoli Chanel. Please add Sony pal channel. Sony pal channel is very publicity and ek matra CID view channel. Do we need to change any new setting from current setting to get "SONY PAL"?